Ohh yea, NWOBHM done very right, this takes me right back in time! 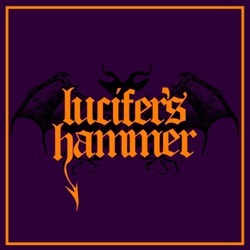 Shadow Kingdom Records is proud to introduce from the land of Chile, LUCIFER’S HAMMER! This is very reminiscent of rare 80’s US Metal gems like SALEM’S WYCH, GRIFFIN, HEATHEN’S RAGE, DAMIEN THORNE, etc. Also more-well known acts like IRON MAIDEN, 80’s JUDAS PRIEST play a huge role in the development of their sound. They’re one of those rare new bands that could actually fool people into thinking they’re an obscure Heavy Metal act from the 80’s that fell beneath the cracks. Luckily for all of us, they’re a brand new band just starting out and they have a lot of good songs in them. “Night Sacrifice (Demo MMXIII)” is the very first of many releases to come. Check out this amazing band!